On a hot, summer day, nothing sounds better than a giant ice cream sundae with all the fixin’s (extra chocolate syrup, of course). While indulging in a big bowl of ice cream is a great treat every now and then, it’s not the healthiest dish to eat every day. Try out these light, healthy, guilt-free summer desserts on your family instead, and enjoy every bite! These refreshing treats are a cinch to make and will please even the pickiest kids. Fill popsicle molds with your favorite fruit blend (ideas below), freeze for about four hours, then add popsicle sticks to each mold and freeze until solid. Fruit and yogurt popsicles: Puree plain or vanilla yogurt, fresh or frozen blueberries, blackberries and/or strawberries in a blender. Add a little honey or sugar for extra sweetness. Grilled fruit is the perfect addition to any barbecue. Simply cut peaches or apricots in half, remove pits and brush with a mixture of oil, cinnamon and sugar or honey. Let them marinate for 10 to 15 minutes, then grill for two to three minutes on each side. An ice-cold smoothie tastes just as delicious as a milk shake, but it’s deceptively healthy and simple to make. For a fruity sensation, throw frozen fruit (cherries, blueberries, raspberries or blackberries), a whole banana, a cup of plain yogurt, a cup of ice and a bit of honey for added sweetness into a blender and puree until smooth. For a chocolate-peanut-butter delight, blend 1¼ cup of milk (or almond or soy milk), one tablespoon of unsweetened cocoa powder, two teaspoons of brown sugar, two tablespoons of creamy peanut butter, a whole banana and a cup of ice. This French dessert is simple to prepare and can be customized in countless ways. To make a basic crepe, mix two eggs, ¾ cup of milk, one cup of flour and two or three tablespoons of butter (briefly pulsing the mixture in a blender produces a smooth consistency). 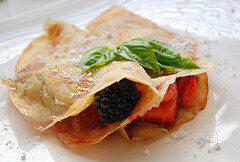 In a small, nonstick pan, melt a small amount of butter and pour batter in a light layer to create a very thin pancake. Cook for about 30 seconds, then flip and cook for another 30 seconds. Garnish small bowls of store-bought sorbet with fresh fruit, chocolate chips or sprinkles and you instantly transform a plain dessert into a restaurant-quality indulgence.